Plus Size Kitten: 100,000 Free Cornettos! Girls it's time to give our guys a free cornetto! (that's a good excuse to go rushing but eat ourselves ok? hehe!!!) It's Valetine's Day after all. 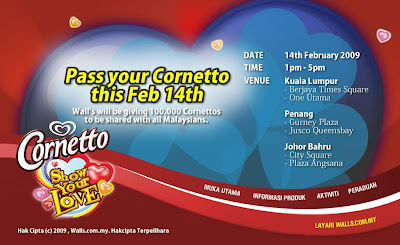 Bring your family, bring your children let's go get each one a Cornetto ice-cream!!! thanks miu..so i can rush to go to Queensbay..thanks again..